Educators play a key role in protecting children from sexual abuse. They can build student supports for understanding and reporting abuse, and foster students’ safety by establishing and enforcing preventative policies and procedures in school settings. Understanding your role in the safety and support of children can help keep them safe from abuse. To all the educators out there: here are three reasons why YOU make a difference. 1. An educator may be the only one who hears about the child abuse. Child sexual abuse and assault reportedly happens to 1 in 4 girls and 1 in 20 boys in the United States (Finkelhor, D., Shattuck, A., Turner, H. A., & Hamby, S. L., 2014), so chances are that every educator knows several children who have been or are being abused. There are many reasons it can be hard for kids to talk about abuse, including fear. Educators who provide safe and supportive environments for their students may receive reports of abuse. A child who works up the courage to report their abuse may only be able to work up that courage once. Take every report of abuse seriously. 2. Educators can be the last line of defense for a child being abused at home. Ninety percent of sexual abuse offenders know the family or child. Vulnerable children who experience abuse by a family member may not feel comfortable reporting it to a parent or someone else at home, and instead may turn to an adult at school they feel safe around. Find prevention tips and learn the signs of child sexual abuse from Committee for Children’s child abuse prevention resources. 3. Educator actions can lead to increased reporting of abuse. Abuse often goes unreported. In the moment a child does report, it’s vital for educators to know what to say and do—to stay calm, help children feel safe, and reassure children who disclose abuse that they did the right thing. This kind of response can make all the difference in minimizing the fear, worry, shame, doubt, and other negative feelings children may experience during and after reporting. Educators don’t always know what to say and do when a child reports abuse, however. Two of the top reasons why teachers under-report are lack of knowledge about the signs and symptoms and fear of making inaccurate reports—so educator training is essential. Research indicates that adult training and education is one of the most effective ways to prevent abuse (Finkelhor, D., & Dziuba-Leatherman, J., 1995). Learn the signs of child sexual abuse. Student education is another key component to preventing child sexual abuse. 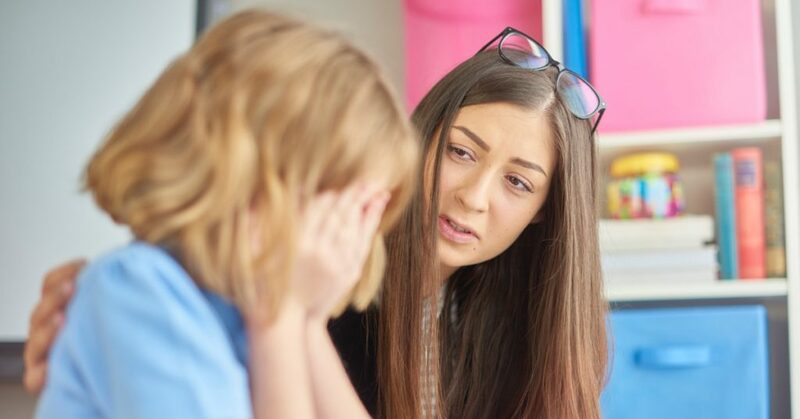 Research shows that effective abuse prevention efforts include school-based prevention programs—children are less likely to be victimized when caring adults teach them about sexual abuse (Finkelhor, D. & Dziuba-Leatherman, J., 1995). The Second Step Child Protection Unit is one example of a research-based prevention program that supports educators in responding to reports as well as teaching students how to recognize and report abuse. Effective implementation of school procedures and policies can also prevent maltreatment in schools (Plummer, C., 2013). Lack of reporting procedures and lack of clarity about reporting are two more reasons why teachers under-report abuse. While educators play a critical role in enforcing preventative policies and procedures, administrators are the cornerstone to ensuring that appropriate policies, procedures, and curricula are put in place and supported schoolwide, and that resources are allocated toward these prevention efforts. Committee for Children encourages you to have the Hot Chocolate Talk to prevent child sexual abuse. Check out these resources for teachers, school counselors, principals, and other educators to help prevent child sexual abuse, including a family conversation guide you can share with parents. Finkelhor, D., Shattuck, A., Turner, H. A., & Hamby, S. L. (2014). The lifetime prevalence of child sexual abuse and sexual assault assessed in late adolescence. Journal of Adolescent Health, 55(3), 329–333. Finkelhor, D., & Dziuba-Leatherman, J. (1995). Victimization prevention programs: A national survey of children’s exposure and reactions. Child Abuse & Neglect, 19(2), 129–139. Plummer, C. (2013). Using policies to promote child sexual abuse prevention: What is working? Retrieved from https://vawnet.org/sites/default/files/materials/files/2016-09/AR_CSAPolicies.pdf.